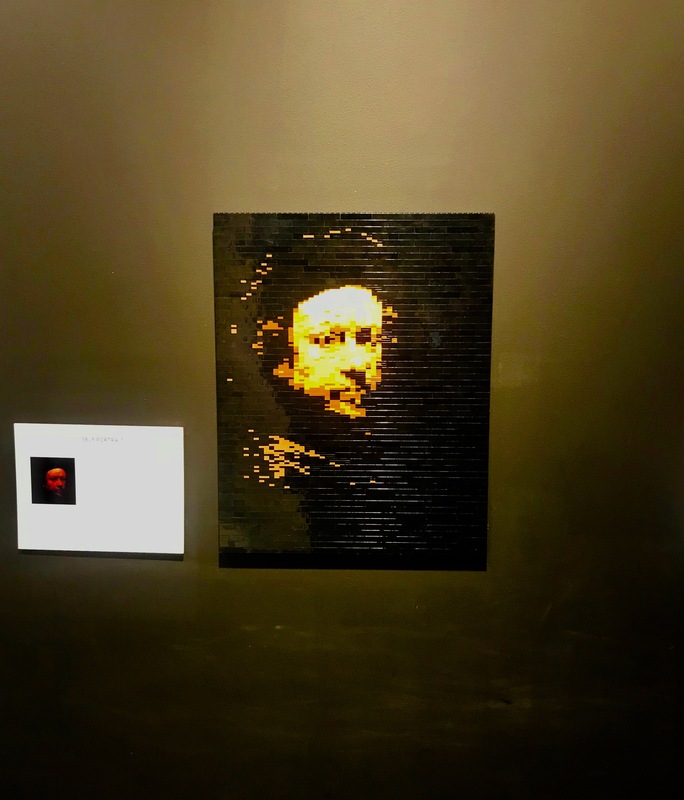 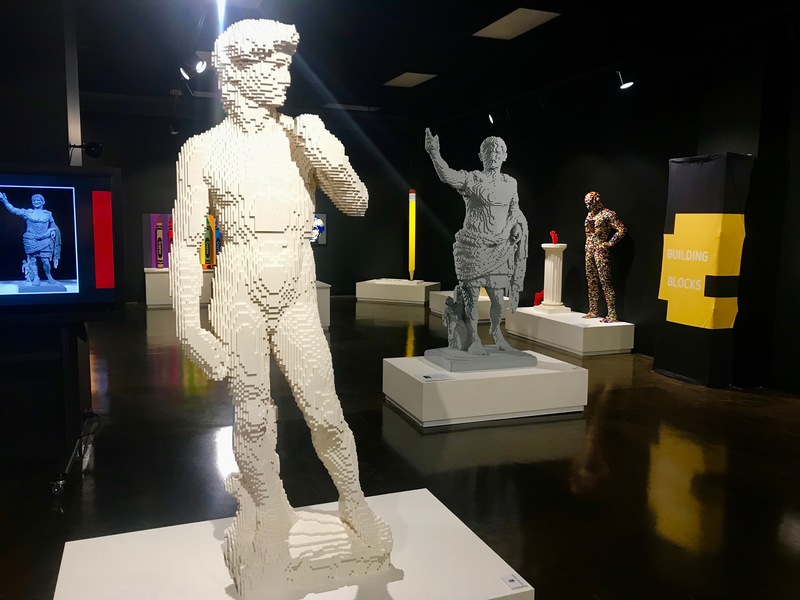 The Art of the Brick is a global touring exhibit by artist Nathan Sawaya. 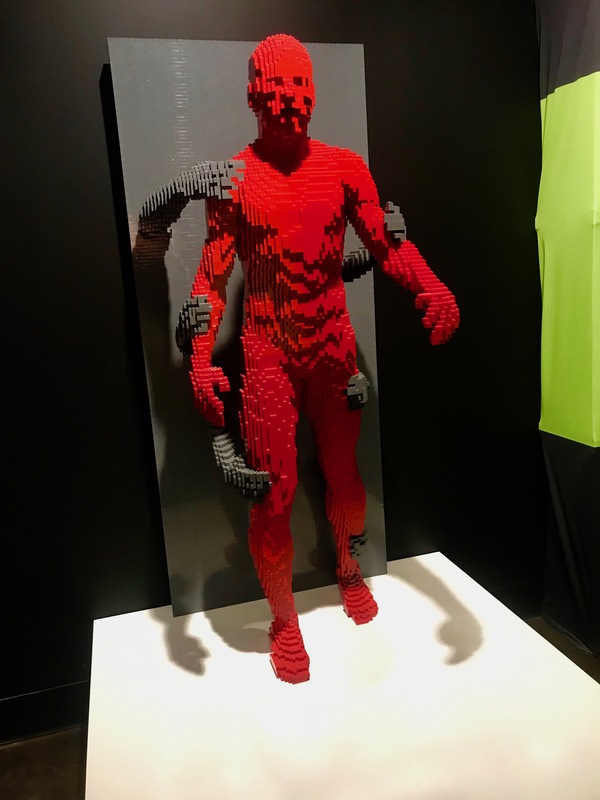 His medium is the Lego. 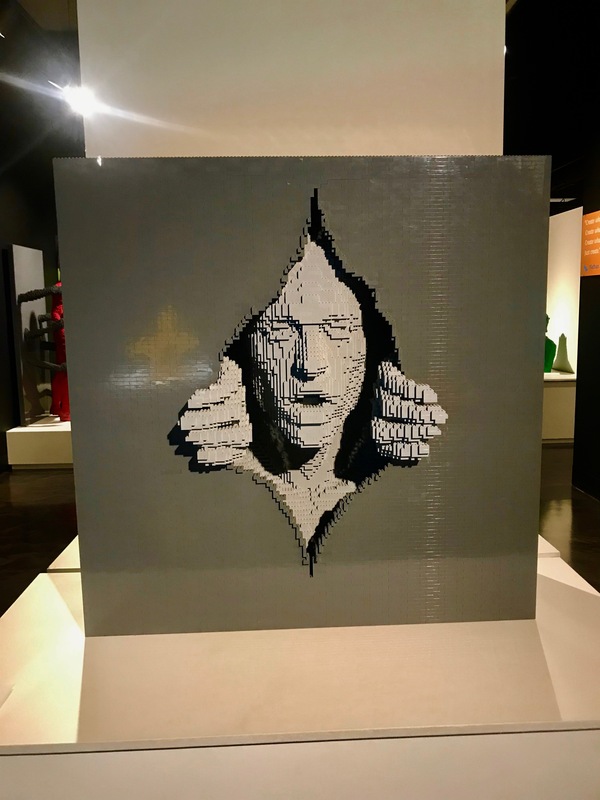 It happened to be at the Buffalo Museum of Science when I was in town. 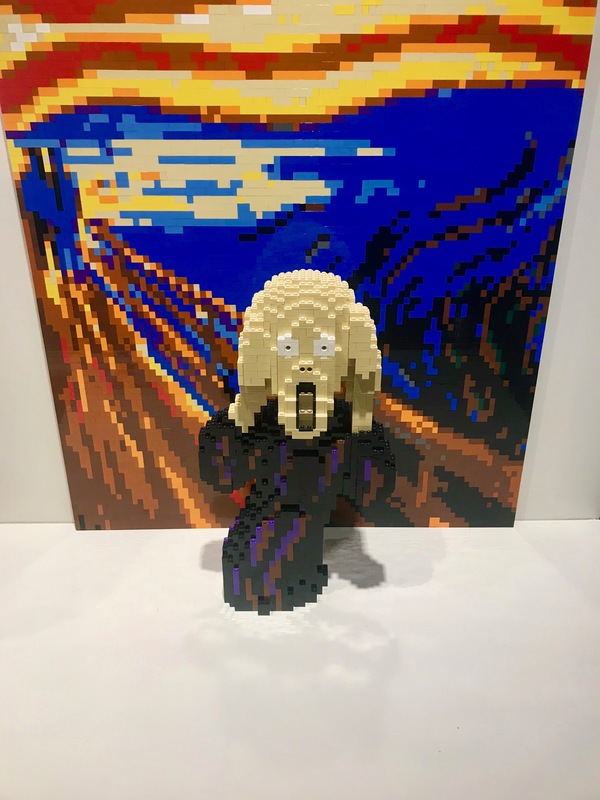 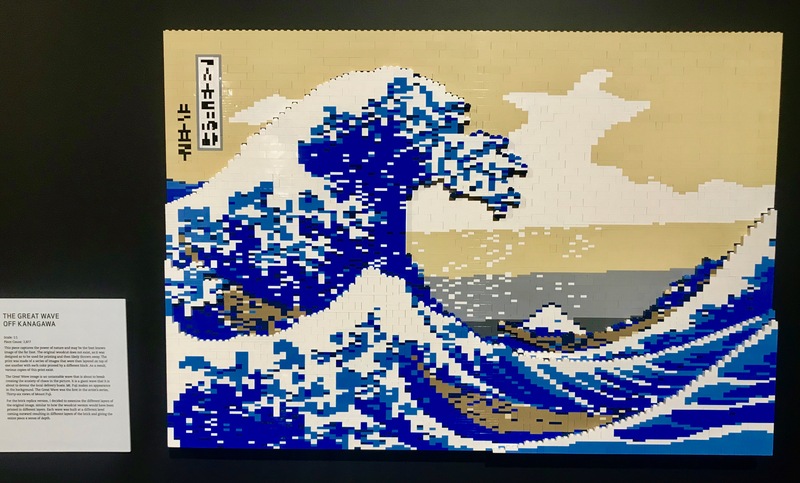 Several of the works were the Lego impression of classic works of art, but the vast majority on display were not based on previous works. 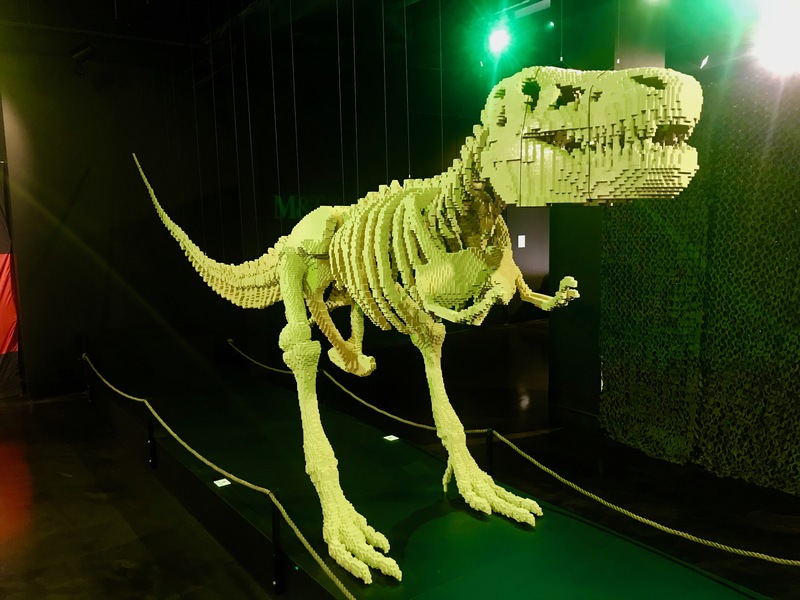 I saved my favorite piece for last: A 20 foot long, 80,000 plus Lego, of a T-Rex. 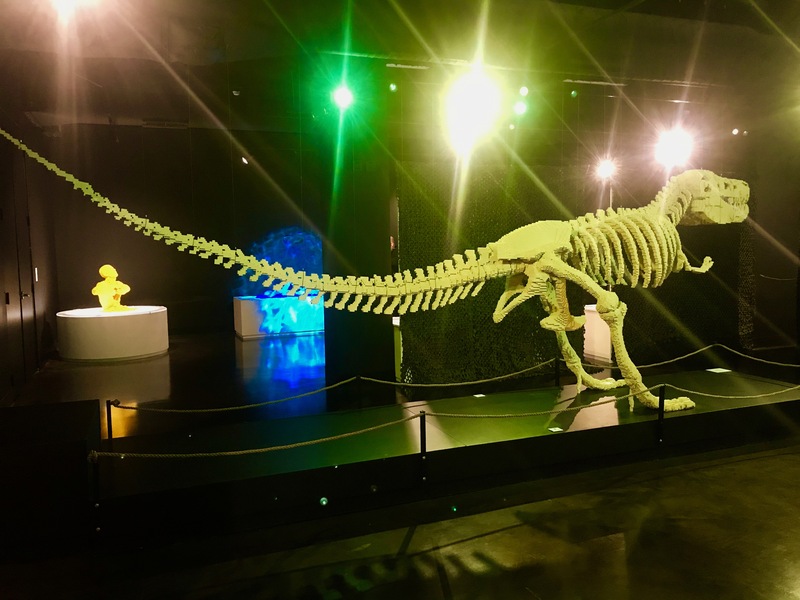 He gets two photos to show the size of this many-bricked dinosaur. 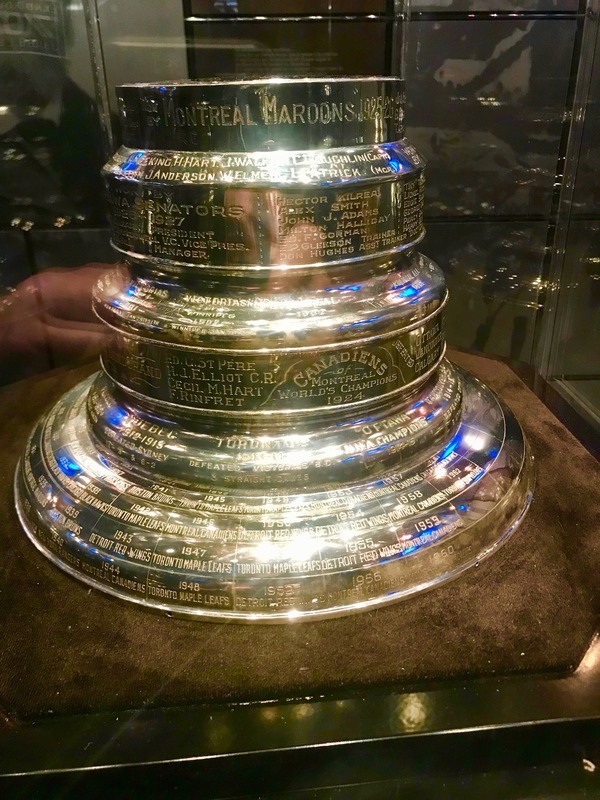 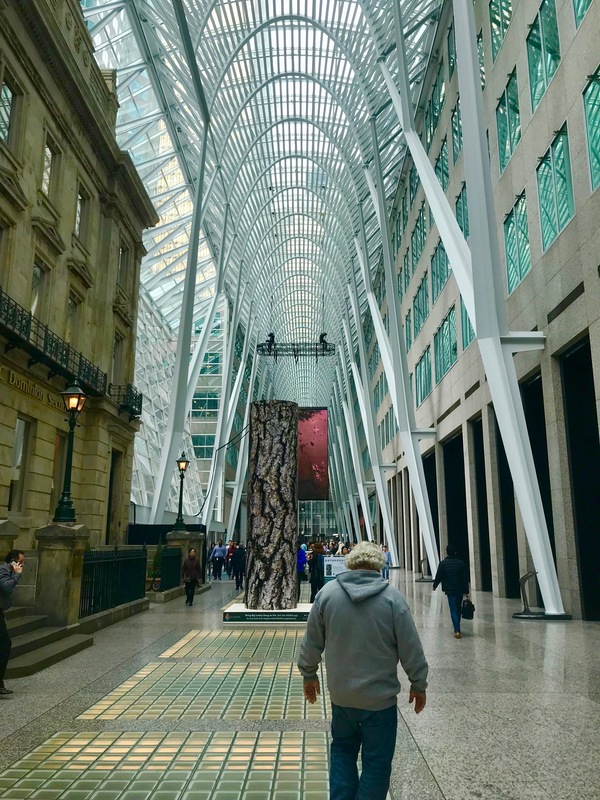 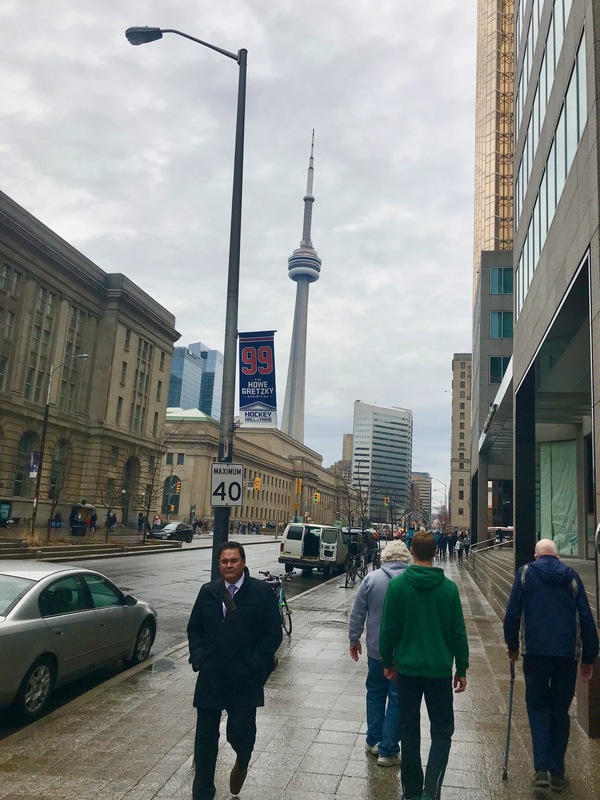 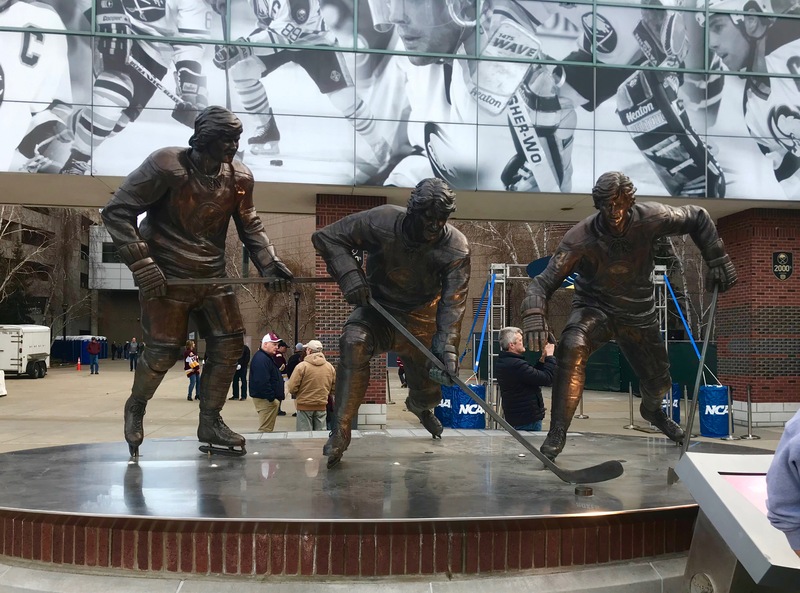 Four members of the Frozen Foursome+ made the pilgrimage to Toronto to visit the Hockey Hall of Fame during the off day of the college tournament. 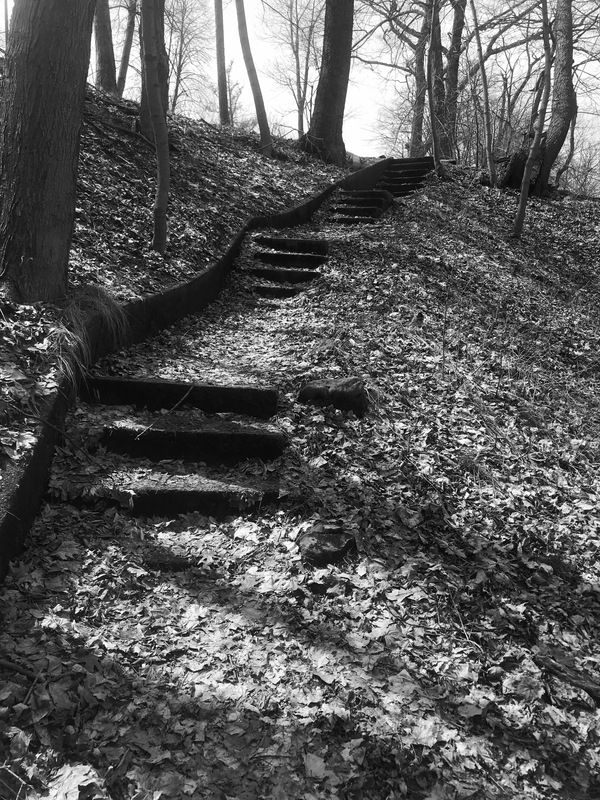 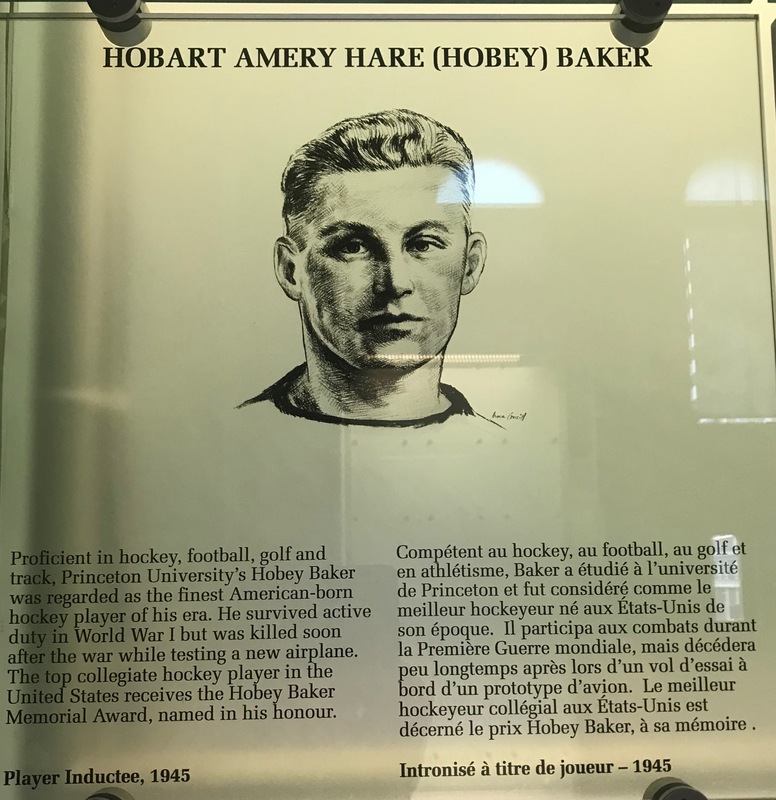 The Hall was established in 1943; it has been in its current location since 1993. 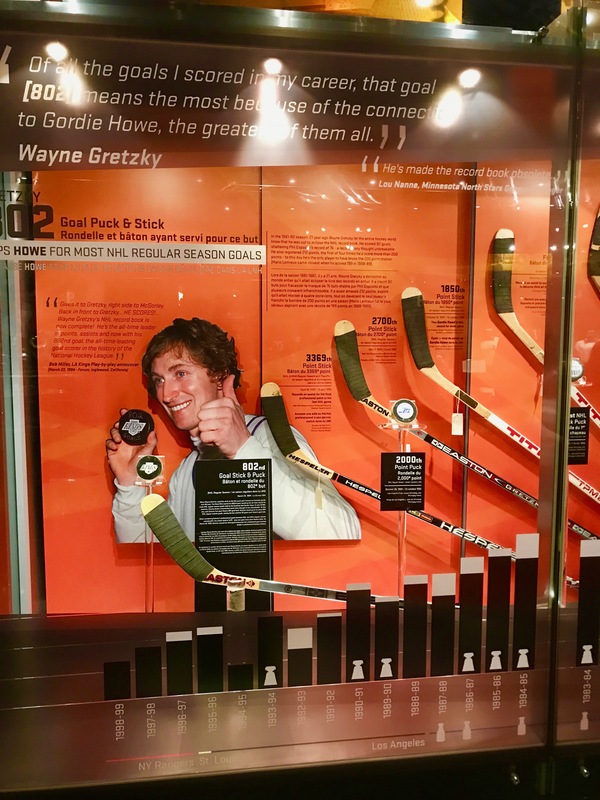 Currently, there is an exhibit honoring #’s 9 & 99: Gordie Howe and Wayne Gretzky. 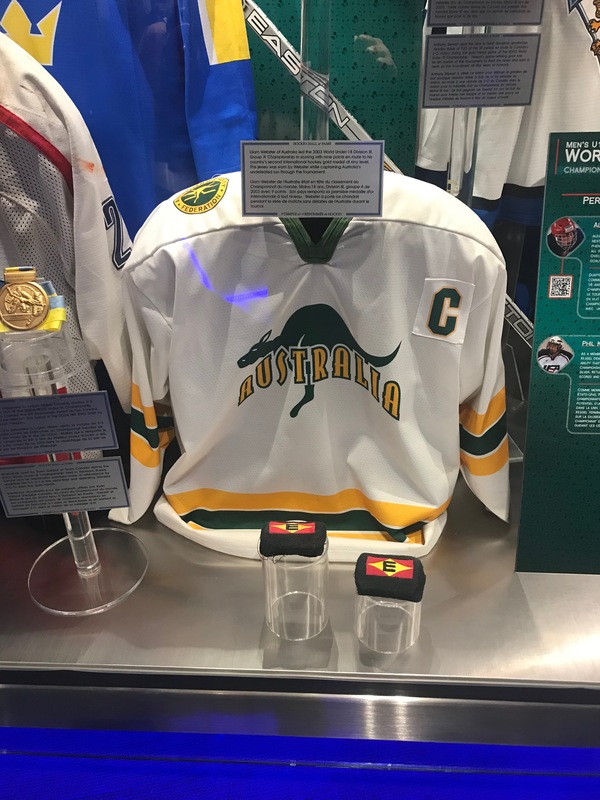 A nice video tribute on both of the legendary players, as well as exhibits highlighting their connection. 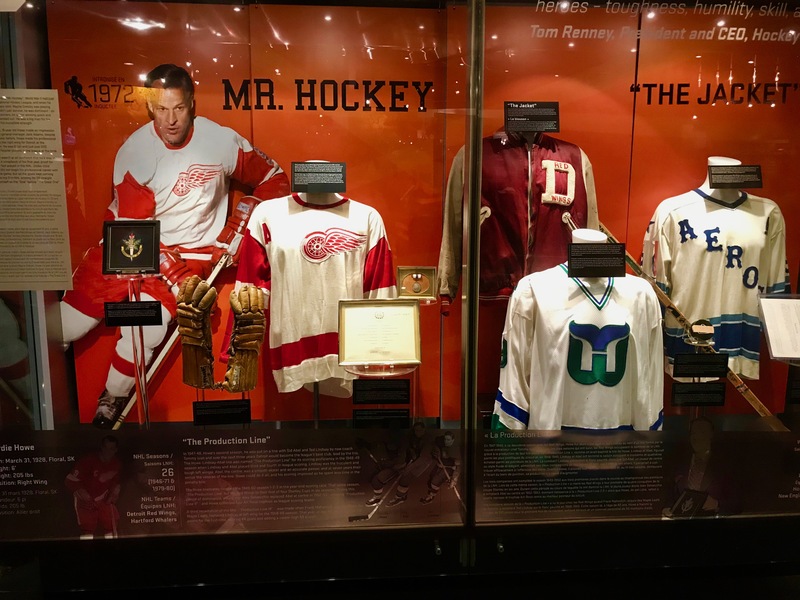 One can not argue with the contribution both made to the game of hockey: Mr Hockey & The Great One. 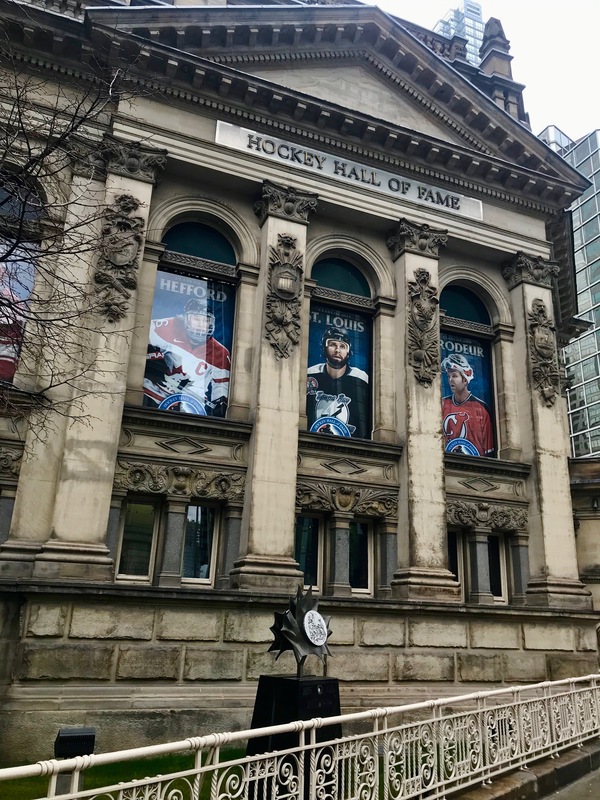 The plaques honoring the players that have been inducted and the various trophies are displayed in the Great Hall, which is in the historic Bank of Montreal building. 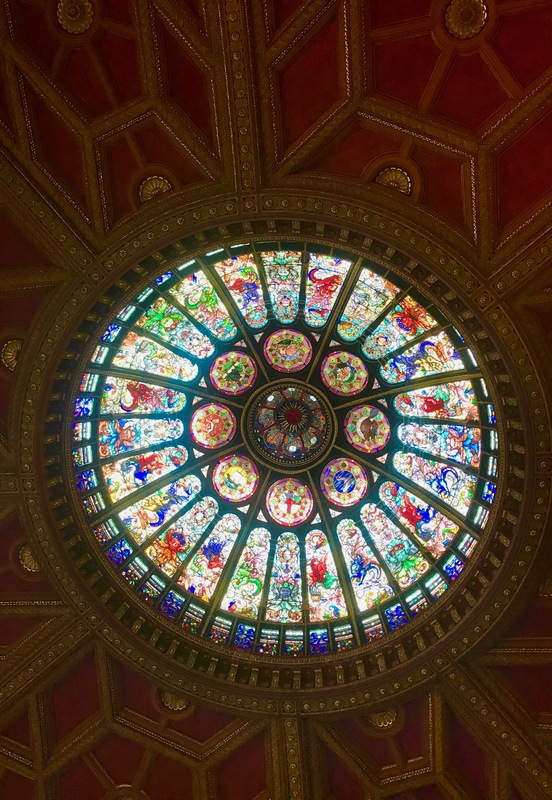 The Great Hall is a stunning room, the highlight of which is the 24 fanned-panel, stained glass dome, with eight stained glass circles, and even more detailed panels on the outer edge and inner section. 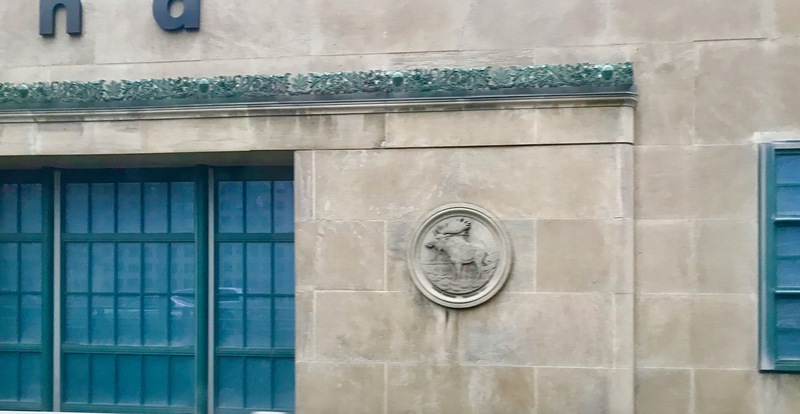 The Bank of Montreal building, which is home to The Great Hall was constructed in 1885. 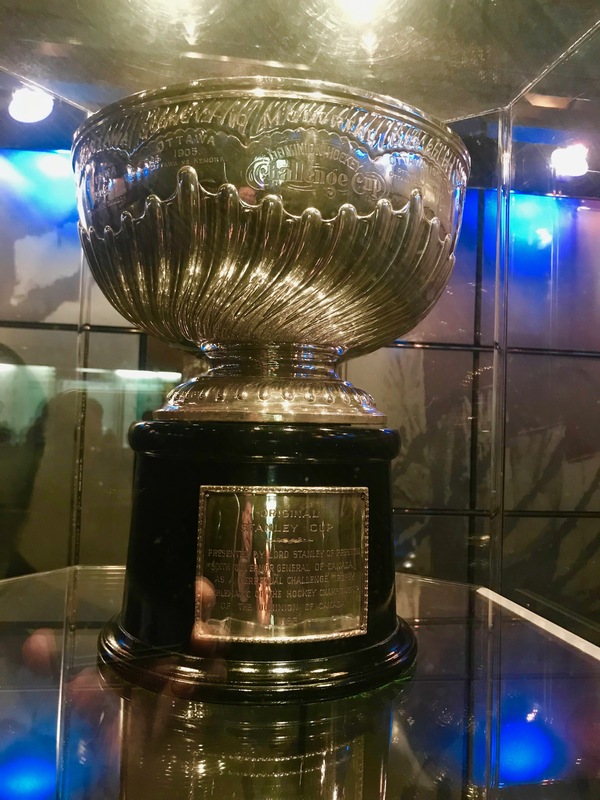 The original Stanley Cup, and the retired bands from the current cup, are stored in the old bank’s vault. 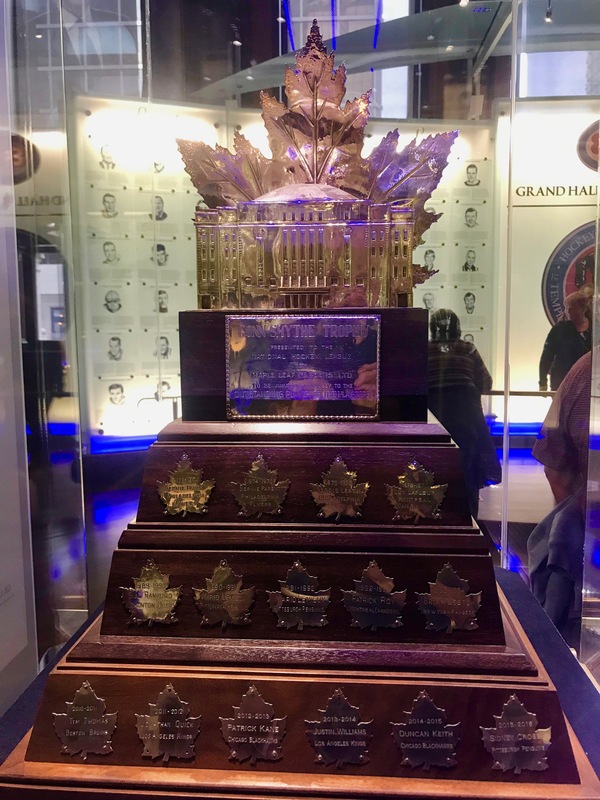 Now known as Lord Stanley’s Vault. 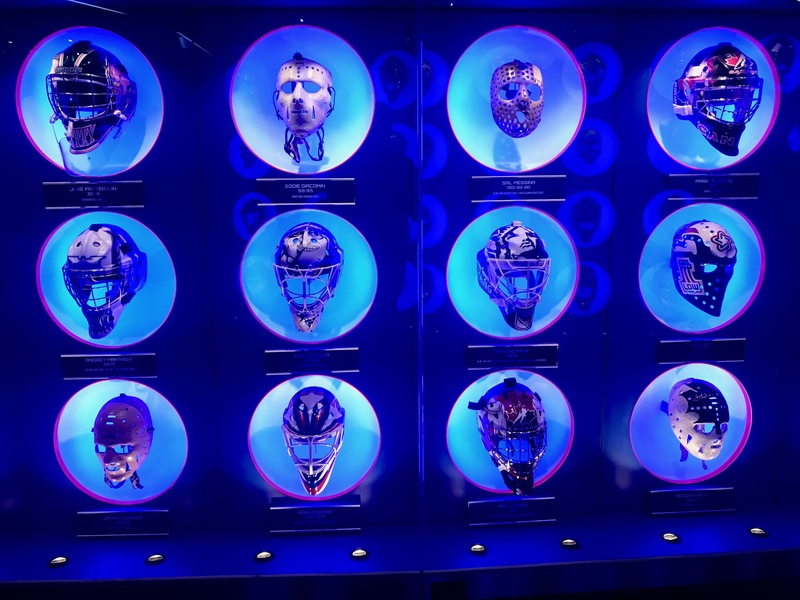 The HHof receives around 300,000 visitors a year. 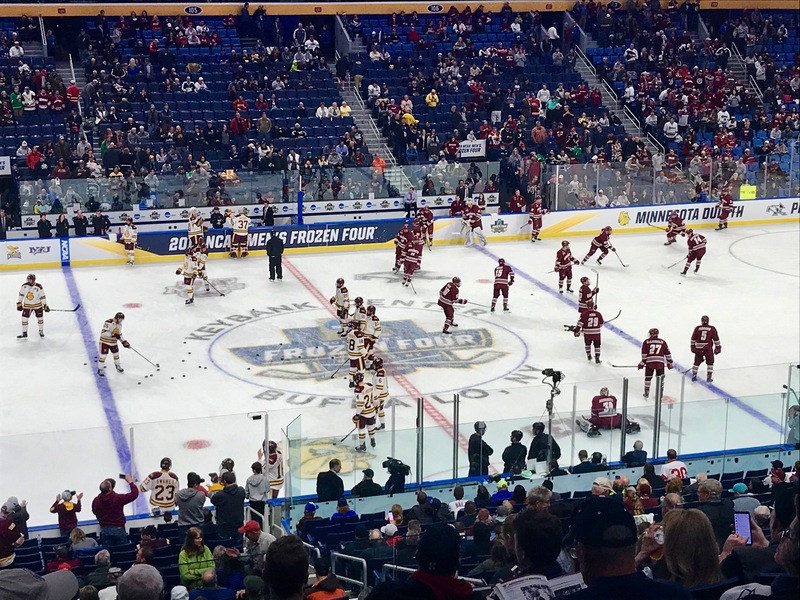 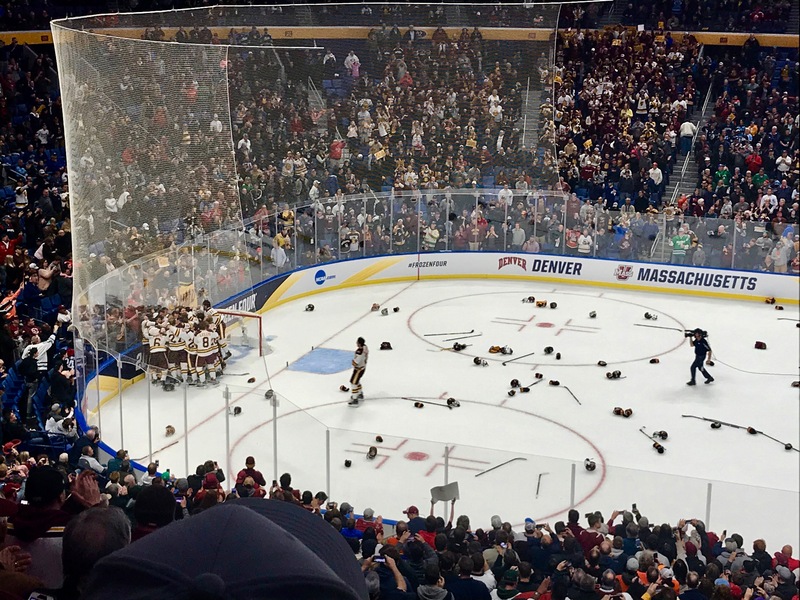 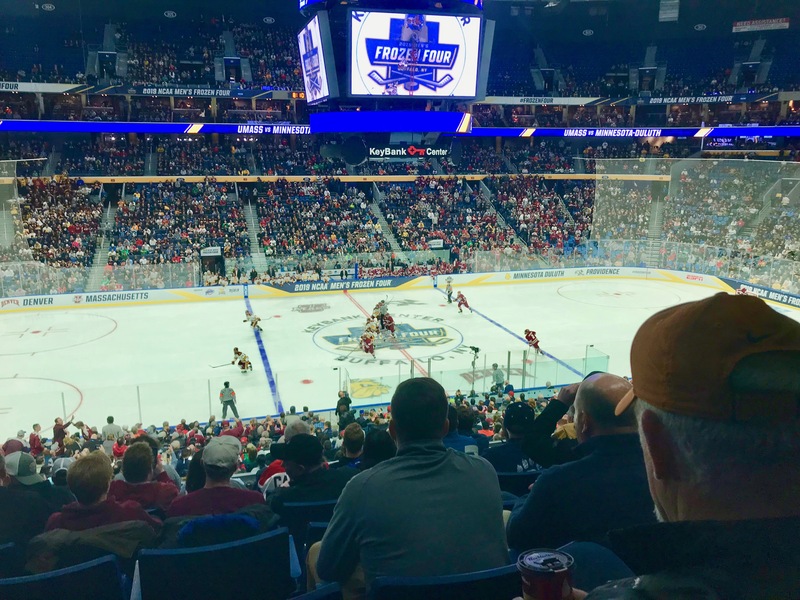 This year, with the Frozen Four held in nearby Buffalo, NY, there was a definite influx of college hockey fans while we visited. 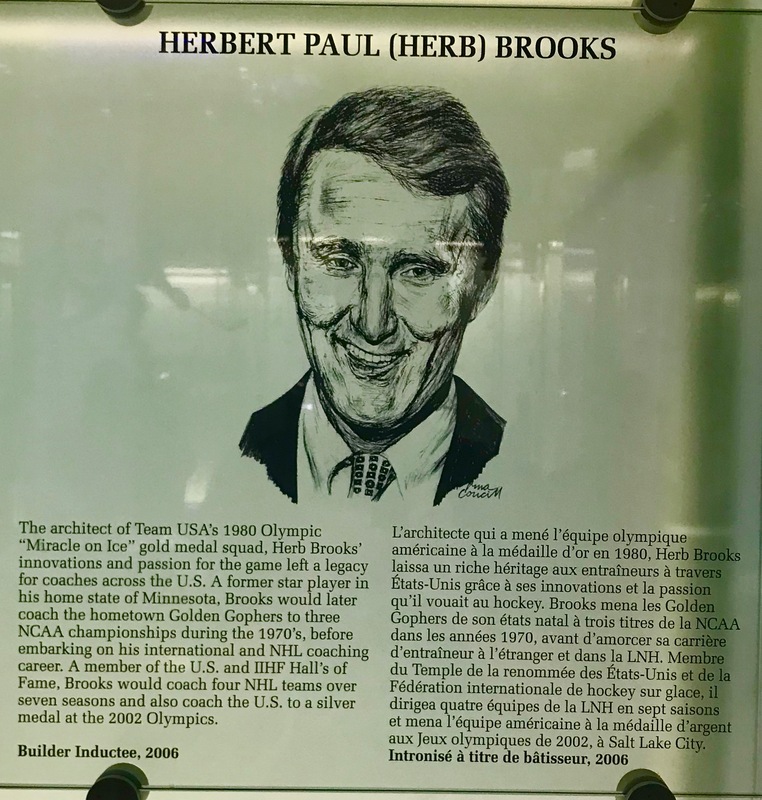 There is an entire section dedicated to international hockey, which includes Olympic Hockey. 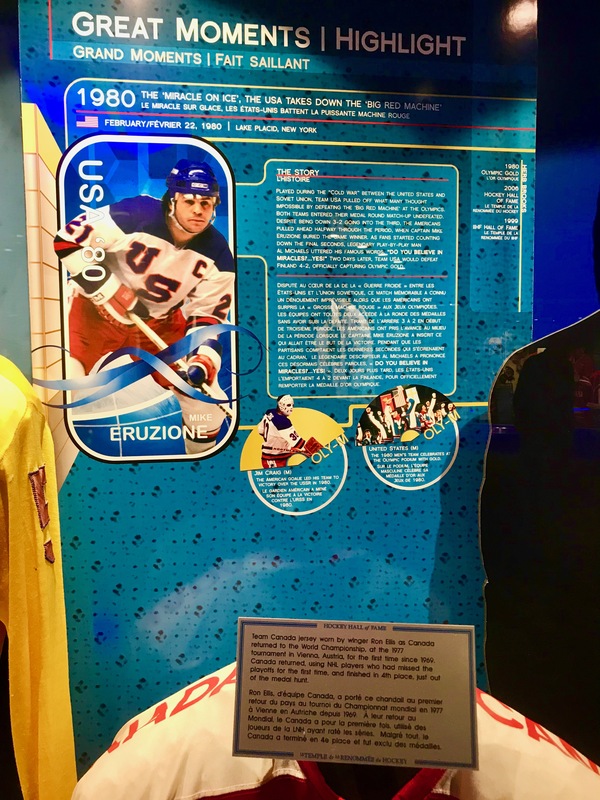 A large exhibit honoring the 1980 Miracle on Ice team was prominent. 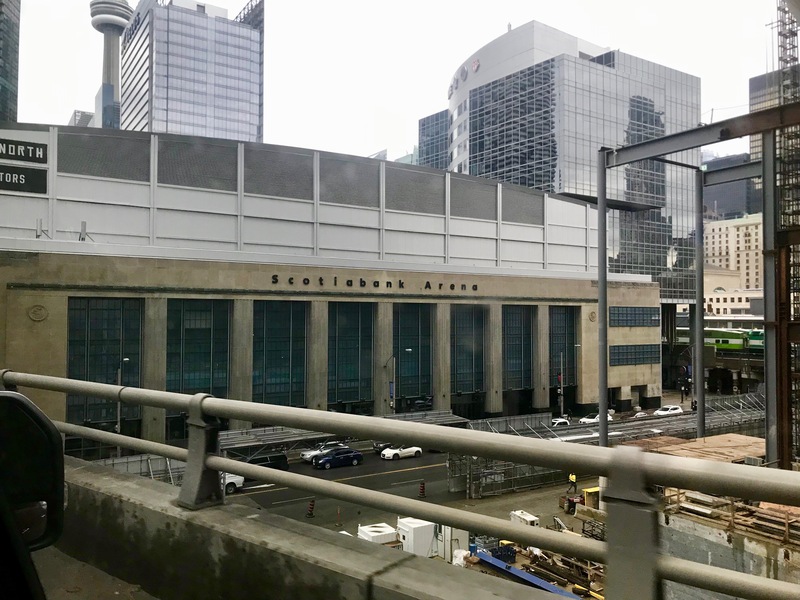 A hockey fan could spend several days exploring the Hall. 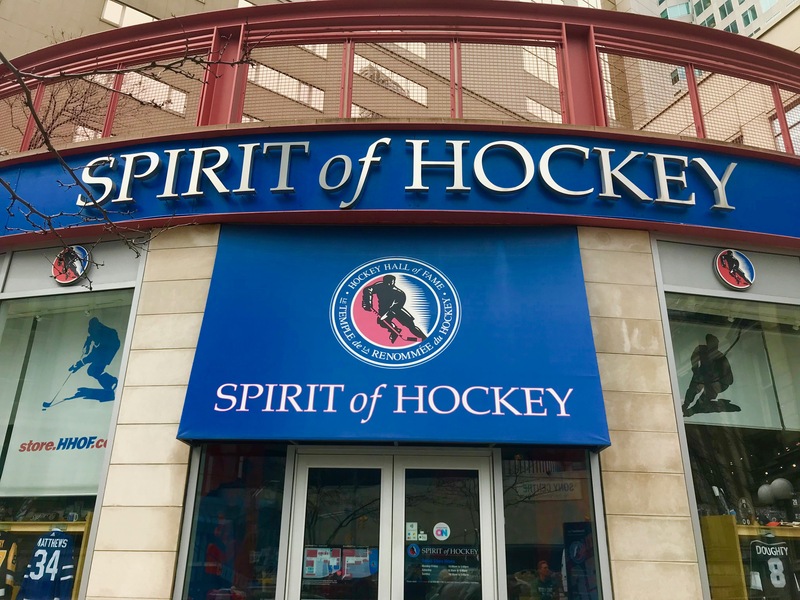 I know that all of our group would have loved to spend more time than we had, but it was a well worth the trip across the border to experience the history of hockey.